The suits at the Beeb are all idiots. Idiots for cancelling Top Of The Pops, but even bigger idiots for also taking ToTP2 off the air and thus robbing us of our musical televisual memories. Of course we have YouTube now and some fine users who endeavour by going through all their old videotapes to find those classic appearance then post them online only for some Beeb lawyer to come along and get it pulled once again. But I say to those out there. Don’t give up. Keep on uploading. Don’t let the bastards get you down. They can’t suppress our will to reminder ourselves of some crappier moments or some finer ones. This is an appeal to all users – please continue to add these 3 minute gems, but this is especially an appeal to the Beeb: You are sitting on over 40 years of TV Gold here. Because you are a public funded institution and not a commercial one I doubt it would happen, but if all of these performances we put on a website or even released on DVD… we need to see them all again. Have access to all again. Don’t hide this archive away. As I said it will probably never happen, because of all the rights, copyrights, record companies and all that we will never see most of it ever again and that’s why YouTube has become what it is. After their 3-1 gubbing of the Ukraine the Scotia boys are top of their Euro 2008 qualifying group.They don’t have any really well known or world renowned players but they are doing what Wales and the Irelands are not doing – winning. In fact thanks to their performances there is a good chance that one of the two big names also in their group might not even get to the finals. It was the 1982 World Cup and Scotland had qualified for the finals. I don’t know what happened but they had difficulty finding somebody at the time to compose and record a single to accompany them over to Spain. Unlike in the previous mention, there were a good number of Scottish acts in the charts, but it seemed that the only person the Scotia FA could convince back then was the Scottish Bruce Springsteen – B.A. Robertson. Also at that time there was another Scotsman who was at the height of his fame thanks to a little film about football. Or was it more about romance…? Either way Nick Hornby must have been influenced by it musn’t he ? I don’t know how it happened. Maybe one day we’ll find out how John Gordon Sinclair came to appear on the record. I would like to hear the whole story of how this all came together. – The lyrics are here. “your country is needing you” Aye just like that. Then bonny Scotland we’ll play for you. – and a visual slideshow via YouTube here. “Look. I’m not being objective. You want objective, go elsewhere. This is the ONLY brilliant football song. FACT. 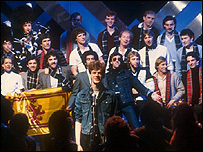 It was penned by the fantastically naff BA Robertson and is a minor triumph – it’s a JOKE football song, nudging to the audience that Scotland are crap and that the dream of winning the world cup is a laughable fantasy, whilst at the same time managing to rouse such spirits in your hearts that you felt Scotland did in fact have a chance. It’s got a reference to ELO’s Mr Blue Sky in it, a conversation with God (a Scot, obviously), a singalong chorus to die for and it ends with massive bagpipes for God’s sake. If you can find a finer example of the genre, I’ll eat several metres of my family tartan. » This is nearly the football and music perfect storm. It has some of the elements, just missing the commentary in the background. Somebody remind me in case I forget – this time next year I will post my footie & music top 10 because this one for me is up there in my top 5. I’m sure at some point you’ll Feature Derek Amitri’s 1998 World Cup ditty for Scotland, “Don’t Come Home Too Soon”. Bah. Don’t qualify for a tournament for another 10 years, more like. And you can download the song here. I want the song but can’t download it as I don’t have quicktime 7 Pro in order to save the file……help! You don’t need Quicktime to save the file. Just right click on the link and “Save Target or Link As…” and save it to your computer.